The Assembly plenary sessions and registration will take place in the Winnipeg Convention Centre, which is also the location for the Assembly offices. Worship and some special events will take place at other locations nearby. The Center opened in 1975 with three levels of over 160,000 square feet (almost 15,000 square meters) of meeting space. "The Forks" in downtown Winnipeg has been an important meeting place for more than 6,000 years. The Forks is where the waters of the Red River and Assiniboine River come together. This is where a Sunday ecumenical celebration will take place during the Assembly. The dramatic scene across the Red River from The Forks and the interwoven history blend well with the LWF Tenth Assembly theme, "For the Healing of the World." 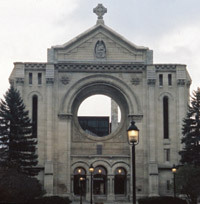 Inside the towering ruined stone walls of St. Boniface cathedral, destroyed by fire in 1968, is a modern cathedral built to serve the French-speaking Roman Catholic diocese. This is where the Assembly Opening Eucharist will take place on 21 July 2003. Up high, where an enormous stained-glass window had been, a circular stone opening allows visions of the sky from the inside. From outside, the open circle draws attention inwards. This sacred space, which has experienced its own death and resurrection, hosted the opening worship of the 1985 constituting convention that brought forth the Evangelical Lutheran Church in Canada (ELCIC). In a country with few large Lutheran churches, the ELCIC has often worshipped at national gatherings in Roman Catholic or Anglican churches. Close ecumenical relationships make this a natural and much appreciated practice. In 1818, missionaries who had traveled two months by canoe from Quebec began the first Roman Catholic mission in western Canada on this site. The small French community of the Red River Settlement grew and established schools, a college and hospital. Many of their first settlers and missionaries are buried in the cemetery in front of the cathedral, including Métis leader Louis Riel, who was president of a provisional government in 1869–1870. The Métis people—of mixed French and Aboriginal, or Canadian native, descent—feared losing their language and property rights when the territory would become a province of Canada in 1870. The French and Métis communities continue strong language and cultural traditions in Winnipeg. Inside the cathedral, a Métis image of Christ, with wounded hands extended, welcomes worshippers at the table of grace. Here in the midst of death, ruin and new life, people from around the world will gather for the opening worship of the LWF Tenth Assembly.